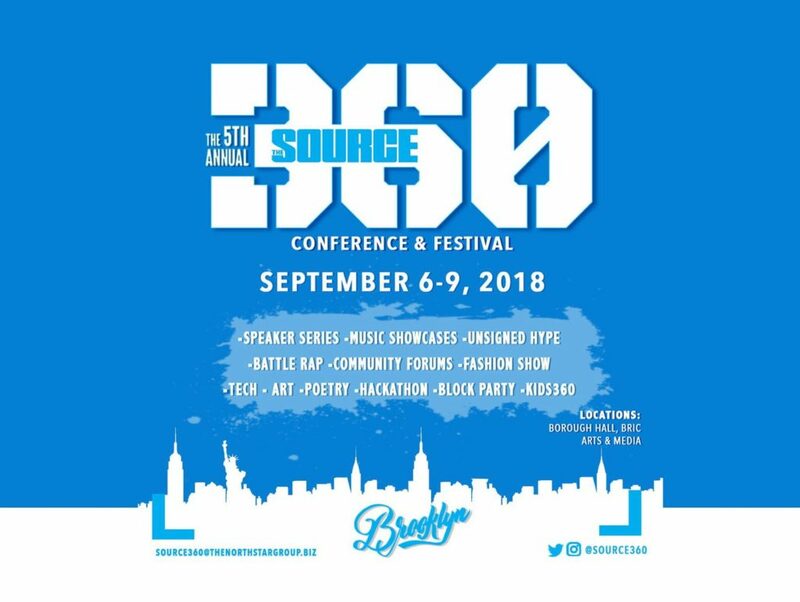 New York, NY (August 18, 2018) – L. Londell McMillan, Chairman of The Source Magazine and Northstar Charities has announced The 5th Annual SOURCE360 Conference and Festival will take place, once again, in Brooklyn, New York, September 6-9. The 4-day conference and festival is mostly free to the public. Selected ticketed events are now open and available on Eventbrite. All events offer to the general public a full spectrum of performances and activations that engage and educate the community about the culture of Hip-Hop, arts, culture, music, fashion, sports, business, technology and crucial public policy concerns such as criminal justice reform. For 30 years, The Source Magazine has been the Bible of Hip-Hop. For the past five years SOURCE360 has become more than a festival and hub of creative performances, but a gathering of national entertainment and civic influencers, artists and entrepreneurs ready to assess the state of Hip-Hop, discuss issues influencing the culture and provide opportunities for multi-generational Hip-Hop leaders to discuss the changing state of Hip-Hop and ways to bridge the gap between the young and old, locally and nationally. Confirmed performers, speakers and participants include, but are not limited to, Brad “Scarface” Jordan, Doug E. Fresh, DJ Kool Herc, Jim Jones, Maino, Casanova 2X, Phresher, Freeway, Mysonne, DJ Self, Dream Doll, KeKe Wyatt, Elle Varner, Mekka Don, ARNSTAR & Waffle NYC, Free (from 106th & Park) Josh X, Jaquae, DJ Nyla Symone, Taylor Girls, Bali Baby, Kyla Imani, Young Prophet, Young Devyn, Square Off Gang, Mariah Lynn, Justin Love, Ambassador Attallah Shabazz (eldest daughter of Malcolm X), activist Tamika D. Mallory, Reginald Hudlin, Nelson George, Kim Osorio, Marc Baptiste, Misa Hylton, Zab Judah, Africa Miranda, Tasha Turner, Kassandra Frederique, Dasheeda Dawson, Gia Thompson, Sonya Davie, Dana Rachilin, L. Joy Williams, NYPD Chief Maddrey, fitness guru Brittne Babe, and supermodel Jessica White (more to be announced). The SOURCE360 Conference and Festival (at Brooklyn Borough Hall) features the following panels: Health and Wellness, Community and Policing and The Business of Cannabis. The SOURCE360 Conference and Festival (at BRIC Media Arts Center) features the following panels: Social Justice, Music, Technology and Making It in The Business and The Glam Panel. Friday Concert: “Unsigned Hype” and “Mic Check,” The Source’s music showcases for new and emerging artists. This entry was posted in Uncategorized on September 6, 2018 .